You cannot go wrong banking with one of the highest ranking banks in America! With access to 16,000 Chase ATMs and nearly 5,000 branches and the ability to deposit checks from virtually anywhere, anytime, just by taking a photo with the Chase Mobile®app. 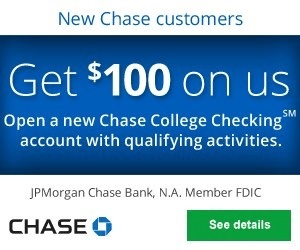 Opening a new Chase College CheckingSM Account offers you the potential to earn a $100 bonus as well when meeting certain requirements! Below is all the information and details you need to earn your Chase College CheckingSM Bonus! In addition to the current promotion from Chase, you can also take advantage of a range of great promotions from banks such as HSBC Bank, Chase Bank, Huntington Bank, Discover Bank, TD Bank, BBVA Compass Bank or CIT Bank. Chase College CheckingSM: If you are eligible for this bonus offer, see table above to learn more! If you are interested deals, see our compiled list of Chase Bank Promotions. Complete at least 10 qualifying transactions within 60 days of account opening. After you have completed all the above requirements and the 10 qualifying transactions have posted to your account, we’ll deposit the bonus into your new account within 10 business days. Zero Liability Protection: You won’t pay for unauthorized card transactions if you notify us promptly (see your account agreement for limitations and details). The Monthly Maintenance Fee Is Easy to Waive. As mentioned above, there is no monthly service fee from the time of account opening until after the student’s expected graduation date up to 5 years. However, the $6 monthly fee is “low” compared to other “adult” bank accounts – on top of that, the fee is super easy to waive (see below for details). That fee can be waived simply be meeting the specified requirements OR if you can prove that you’re currently enrolled in college for up to five years of account opening. Simply & Easy Sign-Up Bonus. You can score an EASY $100 bonus by opening the account and meeting the simple requirements – enroll in eStatements & complete 10 qualifying transactions within 60 days of account opening and the bonus is yours! Mobile Check Deposit. Let’s say you transfer to or attend a college outside of one of the states Chase is available in – you’re able to deposit checks using Chase’s mobile check deposit feature! That’s a plus if you are not near a Chase Bank/ATM! Free Access To Over ATMs and Branches. You’ll be eligible for fee-free withdrawals at 16,000 Chase ATMs and nearly 5,000 branches nationwide. Minimum Opening Deposit Requirement Is Low. All it takes to open this account is $25! As frugal as college students are, a small $25 deposit is not difficult to accomplish. Once your account is open, there is no minimum balance required. Text Banking. Nowadays, we’re constantly on our phones – with Chase’s text banking feature, it’s quite convenient. You can send money, receive money, check your balance, and much more by simply using this feature. As a college student, this Chase College CheckingSM Account Bonus can go a long way. 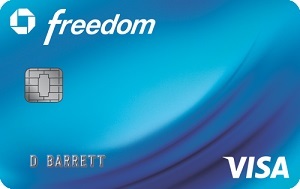 With the opportunity of a free checking account on top of a bonus with great account benefits, you can’t go wrong! 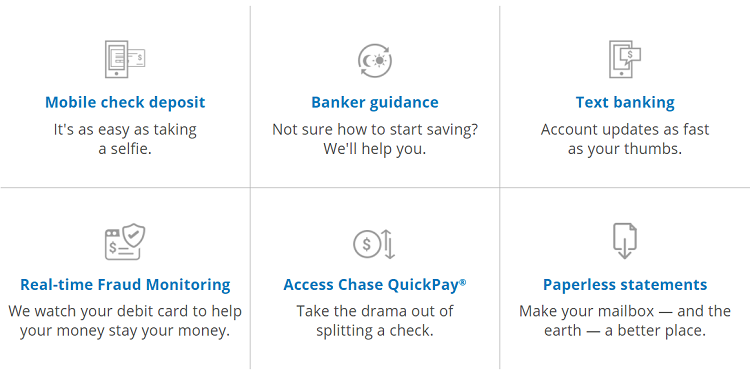 Definitely make Chase Bank one of your top choices when you’re deciding on switching banks or opening your first account(s). For more Chase Bank offers, see our full list of Chase Coupon Promo Codes. Be sure to check back on BankDealGuy for more bank promotions!